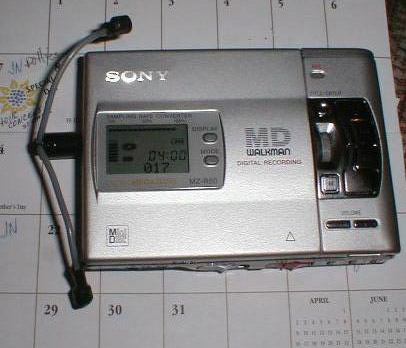 use with Minidisc recorders with "Plug in Power"
How to make a stereo or binaural T style mike for about $10. Cut a slot in the center of the tube approximately 3/8" long and about 1/4" wide. The slot's long dimension should be along the tube, not across. It should be just long enough and just wide enough to make a snug fit when you insert the handle of the stereo plug. Cut the cord on the ear buds about 1 foot from the stereo plug and throw out the ear buds, we won't need them. Separate the right and left cords for about 7 inches towards the plug. Take one wire and strip the outside jacket off for about 1 inch and twist the shield wire together and tin it with solder. The inside conductor will be either red or black. Strip 1/4" of insulation off it and tin the wires. Repeat this with the other wire. Thread these wires through the slot you cut in the tube with one wire out each end of the tube. Cut a 1/2 inch long piece of electrical insulating tubing (often called "spaghetti" in electronics shops) and slide it over the end of the red wire and its shield wire. (You can use some heat shrink tubing or even electrical tape, but plastic or varnished cloth electrical tubing is preferred). Solder the shield wire to the ground wire on the mic element. Slide the "spaghetti" over this connection and pull out the red wire. Solder the red wire to the Output, V+ terminal of the mic element. This will be the right channel. Repeat this process for the left channel with the black center wire. Slide the mic elements into each end of the tube, and slide the stereo plug into the slot you cut for it. 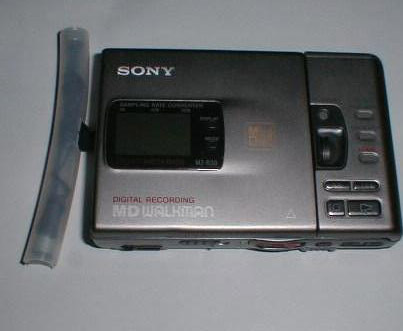 Plug this into the mic input on the Minidisc recorder and record with low mic sensitivity. You can use high sensitivity if you are in a quiet area, but it will pickup any extra noise there is. The mike plugged into my Sony R30 recorder. and mike cord. This is dubbed the "bug antenna" mike. It was designed by a friend.